[Linguistik Aktuell/Linguistics Today, 242] 2017. vi, 374 pp. The e-Book is available under a CC BY-NC-ND 4.0 license. Within the current discussion on grammatical interfaces, the word-classes of adjective and adverb are of particular interest because they appear to be separated or joined in manifold ways at the level of word-class or syntax, with morphology playing a prominent role, especially in Romance. 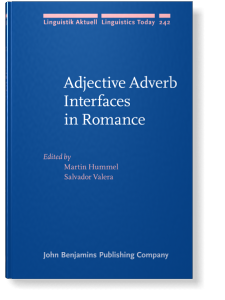 The volume provides typological and theoretical insights into the common or different usage of adjectives and adverbs in Romance. Diachronic change is discussed alongside with synchronic variation and the representation in grammar. The discussion turns out to be controversial, calling into question traditional assumptions such as the dogma of the invariability and the categorial status of the Adverb. The languages under scrutiny are Latin, Catalan, French, Italian, Portuguese, Romanian, Spanish. It is the first publication on this topic that provides insights into all Romance languages including Latin. Discussion is controversial but there is a clear tendency to criticize the traditional separation of the word-classes of adjective and adverb in favor of a single word-class approach, where the adjective displays syntactic and morphological variants that are linked to different functions. Chapter 5. Are intrapredicative adjectives adverbs?